THE MARTINI CHRONICLES: Future Diva on Deck!!! Greetings Divas and Gents! This may be surprising to some of you, but I love hearing what my readers think of this blog, and brainstorming about different ways to keep the content fresh and exciting for current and potential readers. A few months ago, I had the opportunity to speak with Lydia, one of my long-time readers and subscribers, regarding the potential direction of the content of the Chronicles. One of Lydia's critiques was that there was too little of ME. Specifically, she noted that I did not share enough information about myself and my personal experiences. She believed that sharing more of myself with my readers would help others feel more connected to the blog's content and, by extension, more connected to ME. I mulled over this critique, and I realized that Lydia was right! After all, I cannot expect my readers to be open and honest with me if I am not willing to share more about myself with them. I get it...and I'm on it! In the spirit of sharing more of ME with you, I want to share some exciting news! It turns out that the Stud and I are expecting our first child in a few months! 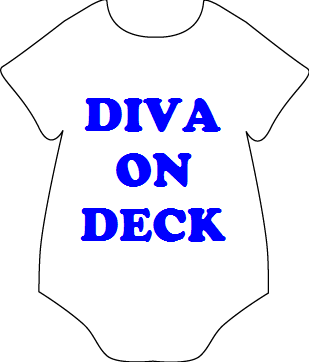 And would you believe that it's a little Diva! Needless to say, we are super excited and anxious about our future. I am also excited about all the new blog material that I will have when I am faced with the task of balancing my professional life with motherhood. I promise you all that I plan to continue blogging profusely about the joys, trials, and tribulations of the professional woman, but new insight is always welcomed. I am hoping that you all will stay with me along the way. So...what do I need from you? Links! I need links to your favorite working mommy blogs. One of my favorites is My Life: The Chronicles of Pookah's Mom, mainly because Rose's Daughter shares her real life experiences of being a mom and a professional. I love Lipgloss & Binky and The Musings of Me for the same reason. If you have any more blogs or sites like these that you love, send me the link! I need to do some research! Also, I am currently not able to sample my own martini recipes...any volunteers!? If so, shoot me an email at theprodiva@gmail.com, and let me know if you are interested in testing a recipe. Finally, I ask for all of your positive thoughts and prayers over the next few months...I'm sure we will need all of them! Thanks for allowing me to share a little bit of myself with you. And expect to learn much more about the Professional Diva in the future! Congratulations!!!!!!!! OMG! I won't lie sometimes the mystery intrigues me but I am definitely looking forward to learning more about you and following you on this journey to motherhood. Oh!! Send me martini recipes I have two kids and just as many businesses. I need a drink! Yay!!! Congratulations!! Awww a little Diva in the making! I can't wait to hear more!! I'm so behind! Congratulations!!! I can't wait to see the direction your blog takes as you share more of you and begin that wonderful balance of being a working mommy. Definitely something I'm interested in reading more about!